With the release of their first eponymous studio album in 1969 and their subsequent appearance at the Woodstock festival, Crosby, Stills and Nash were launched into the firmament of rock stardom. Having all come from individual, successful bands - Crosby from The Byrds, Stills from Buffalo Springfield and Nash from The Hollies - they eventually acquired the status of what would be known as the 'supergroup'. Joni Mitchell was deeply into a romantic relationship with a highly creative and famous fellow musician. Her own musical creativity was a strong force that had been driving her life for the past five or six years when Graham Nash asked her to marry him. Joni was very much in love with Graham but doubts began to creep into her mind about sustaining her own career and identity if she married him. Both of Joni's grandmothers had been women with unfulfilled musical talents. Joni had dedicated the 'Clouds' album to Sadie J. McKee, her maternal grandmother. She felt that it might be her genetic destiny to bring that musical legacy to front and center. In the male dominated music business she feared that she might be overshadowed in a marriage to a high profile performer. Joni had toured with CSN and had been featured in 'Celebration at Big Sur', the film of the 1969 Big Sur Festival. She began to develop negative feelings about appearing in front of thousands of people, finding the experience intimidating and frustrating in comparison to the intimate atmospheres of the clubs where she had been the focus of attention for smaller audiences. In 1970 she made it known that she was retiring from public performance. She was not comfortable with either the mass adulation the popularity of her recordings was generating or the mass indifference that she seemed to encounter in crowds where she was not necessarily the main attraction. She went on an extended sabbatical, which included a trip to Europe. As the amount of the time of their physical separation increased, the possibility of a permanent union between Joni & Graham diminished. Joni sent Graham a telegram from Crete. It contained the sentence "if you hold sand too tightly in your hand it will run through your fingers." The two would remain lifelong friends with great affection for one another but the prospect of a marriage had come to an end. Joni's travel in Europe included an extended stop in Matala Crete where she became involved with the eccentric community of ex-pats and societal drop-outs living in its nearby caves. Although the trip abroad created a physical distance from Graham and some emotional distance from their relationship, it must have also produced a sharp awareness of Graham's absence from her life. The sorrow she felt as she realized that a significant piece of her love life was coming to an end combined with the unique experiences of her travels to give Joni the raw material for her next album. The songs that make up 'Blue' have given the record as a whole the staying power of a tattoo. 'Blue' has been consistently named in almost every radio listener's poll and music publication's list of 'desert island disks' or 'the greatest albums of all time' that has appeared over the last two or three decades. While this distinction places the music and its creator in a select, exalted group, it is also a double-edged sword. Joni Mitchell has created a large collection of widely diverse, complex and challenging music since the 1971 release of 'Blue'. 'Blue' is usually categorized musically as 'folk' and lyrically as 'confessional', both designations that, especially in recent years, provoke Joni's bristly denial. Certainly she has never been anchored in a single style and has sailed in a variety of musical genres during the course of her artistic voyage. But there is no denying the timeless beauty of 'Blue'. Its appearance at a relatively early point of her career only serves to underscore the depth and brilliance of Joni Mitchell's talent. Those few words from the first verse of 'Blue' can be construed as a metaphorical expression of a nexus of emotions and events in Joni Mitchell's life. People had been paying to see her perform since her coffee house days. She had also given birth, been married and divorced. Both personally and professionally she had 'been to sea before' by the time she met Graham Nash and then recorded 'Blue' two years later. 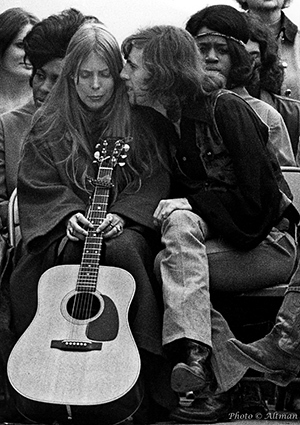 The intense personal connection to Joni that her core audience felt made her songs into indelible impressions and Graham Nash left a permanent mark on Joni's heart. But Joni found that neither her heart nor her creative muse would be anchored. Although Graham would retain a deep love for her and a large part of Joni's audience would remain attached to her early material, in the end both the lover and the fans would have no choice but to let the singer chart her own, solitary course. The devoted admiration of an increasingly large number of people had led Joni Mitchell to attach great importance to public perception of who and what she was at this point of her life. With a strong sense of the need for honest expression, Joni delivered extraordinary vocal performances of unguarded emotion when she recorded 'Blue'. The collection of songs on the record provide an extravagance of original, inventive melody perfectly fitted to finely crafted lyrics. Joni applied the system of alternate tuning she had been using with the guitar to the Appalachian dulcimer and used its sound on four of 'Blue's ten tracks. She also played piano and guitar. With the addition of James Taylor's guitar playing, some pedal steel from Sneeky Pete, Russ Kunkel on drums and Stephen Stills' contributions on bass and guitar, 'Blue' featured more players than any of Joni's previous albums. 'Blue', 'River' and 'A Case of You' are superbly written perspectives of a doomed love affair that hold their own beside the great torch songs of pop music and they are sung with a heartbreaking combination of passion and emotional fragility. In contrast, there is a buoyancy that drives the hopeful optimism of the upbeat 'All I Want' and the bright red devil-may-care attitude of 'Carey'. 'Carey' is a musical character sketch of one of the people Joni met in Matala Crete. 'California' also has its origins in her travels in Europe but in this song, Joni is hearing the call of her Laurel Canyon life and longing to go back to it. She paints a picture of domestic harmony that seems to harken back to her life with Graham Nash in 'My Old Man', a song that tellingly includes the possibly conditional lyrics 'we don't need no piece of paper from the city hall keeping us tied and true'. In contrast, 'This Flight Tonight' is an expression of regret felt just after acting on the decision to leave a lover. This song has the odd distinction of having been covered by the heavy metal rock band Nazareth who released it as a single in 1973 that was a hit in Canada and the UK but failed to chart in the US. 'Blue's closer, 'The Last Time I Saw Richard' leaves the singer sitting in a cafe, blowing the candle on the table out and tasting the bitter dregs of disillusionment in her romantic view of love with the dim hope that it's 'only a phase, these dark cafe days'. The songs that make up 'Blue' were newly written at the time Joni recorded them with one notable exception. Copyrighted in 1967, the song 'Little Green' was included on 'Blue'. At the time of 'Blue's release, the song appeared to be one of Joni's character sketches, a portrayal of a young unwed mother compelled by circumstance to give her baby up for adoption. It is the only song on 'Blue' not written from a first person perspective. The song fits well into the emotional content and sequencing of the album and apparently there was little notice of what might have seemed to be the incongruous inclusion of a story that did not appear to derive from Joni's own experience on a record that had such an intense, personal feel to it. In 1971 it was not publicly known that Joni was revealing an episode from her own life in 'Little Green'. Joni Mitchell has been quoted as saying 'I sing my sorrow and I paint my joy'. This statement may explain why 'Blue' was the first of Joni's albums that did not feature her painting in the design of its cover. The previous release, 'Ladies of the Canyon' was packaged in a mostly white sleeve with a very simple drawing of Joni filling up the left side. She appears to be holding up a portion of her skirt which is partially painted in bright watercolors, depicting a sunny hillside with houses, greenery and cars, most likely a view from her home in Laurel Canyon. The hand written lyrics appear inside the gatefold . 'Blue's cover is a blue and white processed photograph of Joni's face with a microphone in front of her mouth. The face emerges from solid dark blue shadow and the eyes appear to be closed, giving the impression of immersion in a deep emotional place. Joni made a brief trip back to L.A. in March of 1970 to pick up a Grammy Award for 'Best Folk Performance' which she won for her album 'Clouds'. She returned to Europe but was back on the western side of the Atlantic for the Mariposa Folk Festival at Centre Island, Ontario in July. One of the other performers on the bill at Mariposa that summer was James Taylor. She was in England in August where she was part of the Isle of Wight Festival lineup. This turned out to be a raucous affair with Joni scolding the crowd during her set, yelling 'You're acting like tourists, man!' 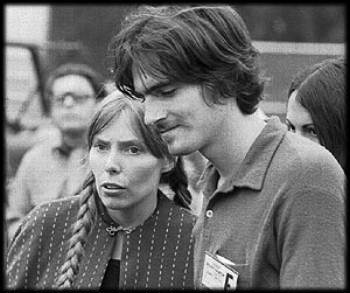 In October, Joni traveled to Vancouver, British Columbia where she performed with James Taylor, Phil Ochs and the Canadian band, Chilliwack at a benefit concert that helped launch Greenpeace. The concert was staged to raise money for the purpose of leasing a fishing boat to sail to the Aleutian Islands to protest the U.S. Atomic Energy Commission's testing of nuclear weapons on the island of Amchitka. Joni was the closer, performing songs from her first three albums plus three songs from the yet to be released 'Blue'. Joni invited James Taylor to join her on stage at the end of her set and the two closed the concert performing as a duo, ending with 'The Circle Game'. By this time Joni and James were more than a musical duo. Joni was once again involved with a musician who was well on his way to building a long and highly successful career. She was also taking tentative steps out of her 'retirement' from the stage, performing with James at the Paris Theatre in London and appearing as 'surprise guest' at several of Taylor's concerts in the U.S. In January of 1971, Joni and James recorded back-up vocals for Carole King's version of the Goffin/King standard 'Will You Love Me Tomorrow' that would be one of the tracks on King's mega-hit album, 'Tapestry'. By all accounts the relationship between the two singer songwriters was a passionate one and there is speculation that some of the songs on 'Blue' were based on their love affair. Possibly the last of Joni's 'guest appearances' at a James Taylor concert occurred on March 28th, 1971 in Honolulu and 'Blue' was recorded in the same month. At some point of 1971 the affair seems to have burnt itself out, however, and James was involved with Carly Simon by the end of that year. He married Carly in November of 1972. This article has been viewed 18,040 times since being added on June 3, 2014.